HERMANN-- Spielwaren GmbH Coburg, Germany. has produced teddy bears for the world for three generations. In Neufang, a small mountain village in Thuringia, close to Sonneberg the Toy Capital of the world, Arthur, Adelheid and Max Hermann start - under the name of their father, Johann Hermann (1854-1919) - "Johann Hermann Spielwarenfabrik" - the production of their first HERMANN Teddy Bear. After World War I, and the death of Johann Hermann in 1919, the brothers and sisters separate and Max Hermann (1899-1955) founded in Neufang, in the birthhouse of the first Hermann Teddy Bears, his own little Teddy Bear company now under his own name "Max Hermann". Shortly after, he moves his company to Sonneberg - at that time the Toy Capital of the world. There he develops his company into a well-known brand name. His Teddy Bears are shipped all over the world. In order to mark and identify his Teddy Bears Max Hermann develops the famous logo "The Green Triangle" and "The Bear with the Running Dog". From that day forward all Max Hermann Teddy Bears are identified with this logo. After World War II, Germany is separated into East and West. The state of Thuringia with its city of Sonneberg becomes a part of East Germany. Max Hermann leaves with his family from the hometown of his Teddy Bears and from East to West to the nearby city of Coburg in Bavaria. Here he rebuilds, together with his son, Rolf-Gerhard (1922-1995), his plush animal factory and continues the tradition of the HERMANN Teddy Bears. On September 23rd, 1955 Max Hermann died. He never has seen again his hometown Sonneberg. German Unity. 40 years after the iron curtain separation, the HERMANN Teddy Bears are able to visit again the place of their genesis - a "Teddy Bear comes home". 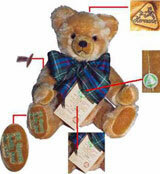 Since 1993, all HERMANN-Spielwaren, GmbH Coburg Teddy Bears are marked with a special "neck mark", which is sealed tight on the Bear's neck. This way, HERMANN Bears are easily identified. Important characteristics of the "neck mark" is the "Triangle shape" with the imprint of "The Bear with the Running Dog". These features have been used since the beginning of the 1930's. This neck mark guarantees the identification of teddy bears manufactured by HERMANN-Spielwaren GmbH, Coburg for today and the future. Today, in Coburg, the old Max Hermann Teddy Bears are produced in the third generation under the management of the founder's grandchildren, Dr. Ursula (1952) and Martin (1963) Hermann. The collection contains more than 400 different Teddy Bears - all made in Germany and most in limited editions. Several have won internationally recognized awards. Replicas of old Max Hermann Teddy Bears, which are produced in the old Sonneberg tradition, belong to the HERMANN-collection along with Teddy Bears from the new generation. Through the experience, knowledge and talent of craftsmen and women from the toy region of Coburg-Neustadt-Sonneberg, the tradition of quality made Teddy Bears is preserved. There are many other Hermann Spielwaren GmbH Bears available, so if you are looking for a particular one that is not shown in our Hermann Bear Store, please let us know and we will send you all the details.